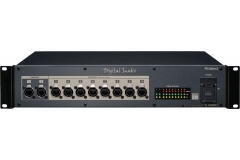 “REAC Embedded Power” is unique Roland technology that enables the transfer of not only the digital audio signal but also the power required by the connected device - all via one CAT5e cable.The S-4000D Splitter and Power Distributor is equipped with 10 REAC ports including 8 ports of REAC Embedded Power. The S-4000D can automatically detect and distinguish a product not supporting REAC Embedded Power. In this case, power is not provided allowing the S-4000D to also function as a standard splitter when required.